Topics: Professional Resumes, Resume Content, Cover Letter, and Professional Resumes. 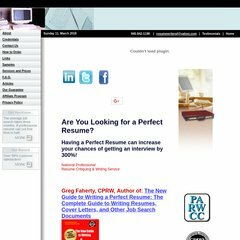 a-perfect-resume.com New York City Professional Resume Writing Service | Greg Faherty ..
a-perfect-resume.com Sample Professional Resumes | NYC Professional Resume Writing ..
a-perfect-resume.com New York City Professional Resume Writing Service | Free Resume ..
a-perfect-resume.com Professional Resume Writer | Non-Traditional Resumes, Curriculum .. It is hosted by Olm Llc (Connecticut, Trumbull,) using Apache web server. There are 2 Nameservers, ns2.host4u.net, and ns.host4u.net. A-perfect-resume.com's IP address is 209.204.225.51. PING www. (209.204.225.51) 56(84) bytes of data. A time of 42.1 ms, is recorded in a ping test.